Boston College embraced the holiday spirit at the annual Christmas tree-lighting ceremony on the Plaza at O’Neill Library on Tuesday evening. The event offered various festivities to the BC community, including a replica eagle ice sculpture, carnival games, and complimentary hot chocolate. A number of acapella groups performed that night, as well, such as the Heightsmen, the Acoustics, the Liturgy Arts Group, the BC Bells, the Sharps, and the Dynamics. 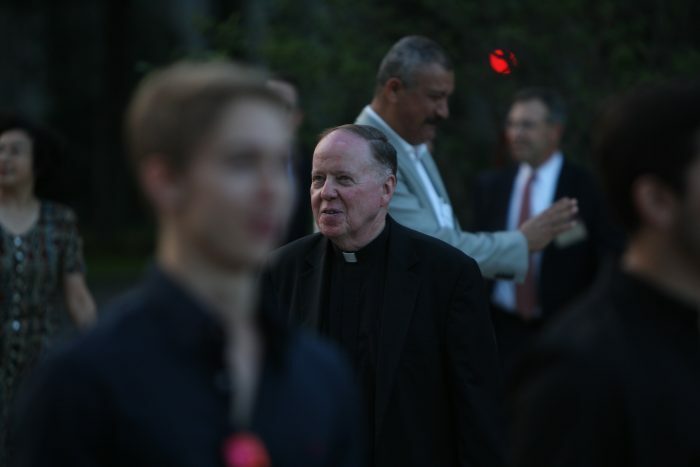 University President William P. Leahy, S.J., also made an appearance and gave a brief speech to the community. “Tonight in this plaza in front of O’Neill, one of the things I hope we do is think about how we have been blessed, and also that we are called to be people who bring light to the world. That we bring our gifts, our hopes, our dreams, and we share those. “And so I invite you to take a look to our left and consider how we can be, in the rest of this month as we move toward Christmas, a light to the world. And with me, if you say, ‘Let there be light.’ And let’s see what our words can do.